Almost six months after the first cases were recorded in Zamfara State, Nigeria’s Ministry of Health (MoH) is still struggling to fight this epidemic in seven states of the country. Médecins Sans Frontières/Doctors Without Borders (MSF) has supported the health authorities with surveillance and case management in the most-affected locations since February when the outbreak was officially declared. However, the slow reaction system of the country and a global shortage of vaccines have hampered the response. Hadiza Usman, a 13-year-old meningitis patient from Sokoto being admitted at the Sokoto Mutalah Mohamad Hospital, with her mother. On April 15 MSF set up a 200-bed treatment center in Sokoto Town, followed by a 20-bed facility in Anka, Zamfara. In these locations, MSF’s Nigeria Emergency Response Unit (NERU) works intensively to provide free, high-quality medical care and reduce mortality rates as much as possible. This little boy is one of 614 patients treated in Sokoto Mutalah Mohamad Hospital since April, when MSF took over the management of the centre from the MoH due to a lack of supplies and qualified staff to run it. In Anka General Hospital, 137 patients were admitted since the beginning of the outbreak. Most are between five and 20-years-old. 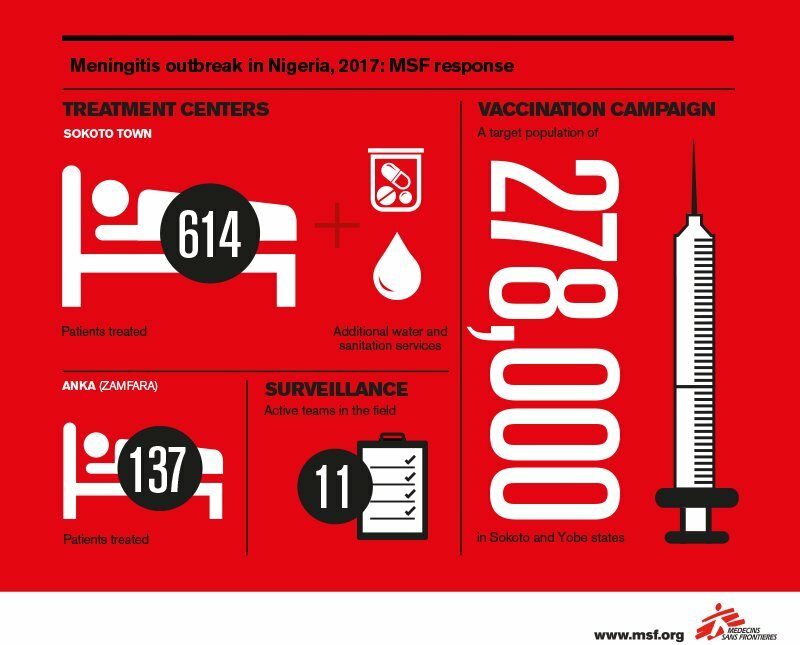 In addition to the staff working in the treatment centres, 11 MSF surveillance teams visited health facilities to determine the origins of new cases in Sokoto, Zamfara, Yobe, Niger and Kebbi. These visits also allowed MSF to implement additional activities, such as health promotion, to increase community awareness of the signs and symptoms of meningitis and active case finding. 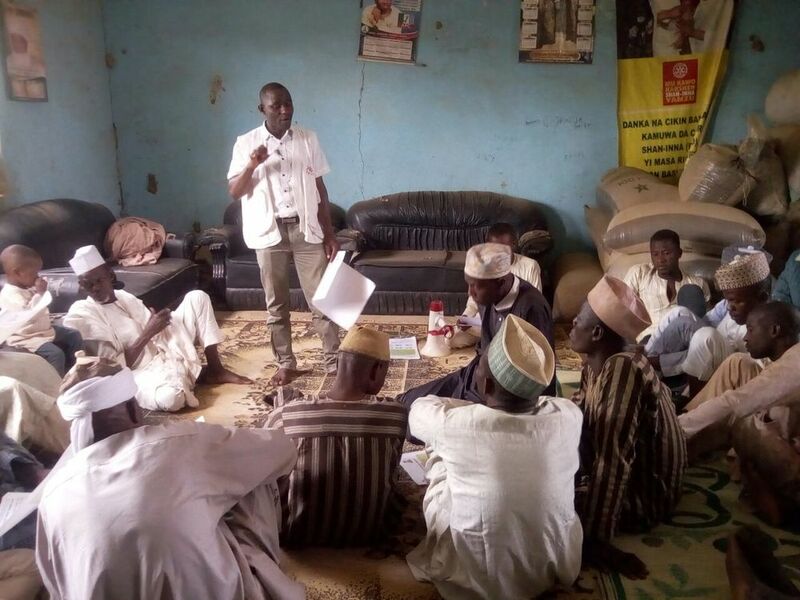 MSF Nigeria Emergency Response Unit (NERU) provides health promotion in Katsura, Zamfara state. The information materials distributed includes flyers and posters in local language to make people aware of the symptoms of meningitis. At the end of April, the Nigerian MoH reported 9,646 suspected cases of meningitis C, with a total of 839 deaths since late 2016. On May 1, MSF was finally able to join a vaccination campaign launched by the health authorities in Sokoto. In the three most-affected Local Government Areas (LGAs), 25 MSF teams vaccinated approximately 850 people per day for seven days to reach a target population of 148,000 people—of a total target of 800,000—between the ages of one and twenty. An additional campaign with a target population of nearly 130,000 will start later this month in the four most affected LGAs of Yobe State. Although these vaccination campaigns are a crucial step to stop the spread of the disease, MSF has concerns regarding the late response to the crisis in a country where meningitis epidemics are not rare. "The national early warning system and timely response needs to be strengthened, and the implementation strategy better-defined, to reduce the impact of the outbreak as much as possible." Even more worrisome is the global shortage of meningitis C vaccine, which contributed to the delayed response and increased mortality rates in Nigeria. “The outbreak is spreading fast and we are concerned because there are not enough vaccines to cover the affected population,” says Aruna. In Sokoto, for example, three million vaccines are required to launch a mass campaign, but only 800,000 were available. This insufficient quantity only allows for a reactive campaign, which requires teams to act fast to prevent the disease from spreading further. 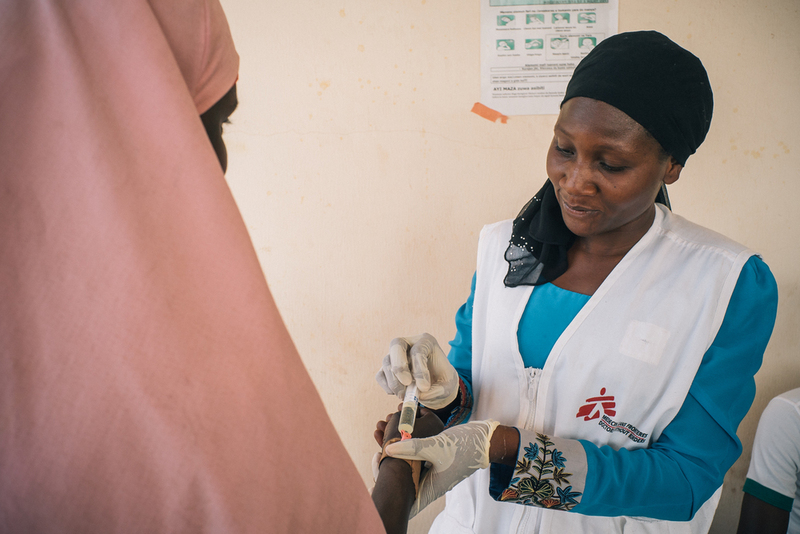 MSF staff member attends to a woman in the meningitis treatment centre run by MSF in Sokoto Mutalah Mohamad Hospital. To address these logistical challenges and reduce the mortality rates, MSF insists that treatment centres be decentralised so that all people affected by the disease, even those in remote areas, can access free, quality health care and the right tests to quickly confirm cases and prevent misdiagnoses. It is crucial that adequate prevention measures be put in place to avoid another delayed response when the next meningitis outbreak inevitably occurs. 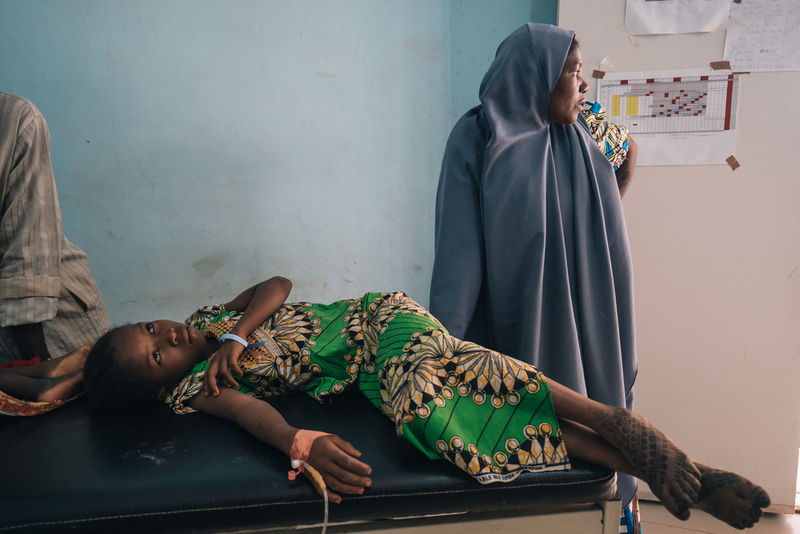 MSF has worked in Nigeria since 1996, running extensive projects on child health, sexual and reproductive health, lead poisoning, and reconstructive surgery in places like Sokoto, Zamfara, Niger, Port Harcourt, and Jahun. The MSF Emergency Response Unit (NERU) also responds to medical emergencies such as meningitis and measles outbreaks. NERU has been active in the country since 2006. MSF has provided health care to people displaced by violence as well host communities in northeastern Nigeria’s Borno State since mid-2014. The organization currently manages 11 medical facilities in seven towns in Borno (Maiduguri, Dikwa, Monguno, Gwoza, Pulka, Ngala, and Benisheikh) and regularly provides care in four other locations.